Those who can knit or crochet are invited to join effort. And if you can't you can donate materials or cash to the project. Sandra Breuer is a self-professed yarnivore. "I devour yarn," she says of her passion for crocheting. She also has a heart full of gratitude for veterans and recognizes that homelessness is an issue with veterans and others in Oregon. As a Clackamas County employee she was aware of the Clackamas County Veterans Village, a transitional community for veterans. The county has set a goal to end veterans' homelessness by 2019. As a significant step toward that goal the county is working with Catholic Charities, and it is also collaborating with partners at Portland State University and City Repair to design and construct a temporary transitional shelter community on county-owned property. "Exciting stuff," says Breuer. "In November 2017, it occurred to me that these veterans are going to need things. And since I'm a crocheting fiend, my next thought went to blankets." 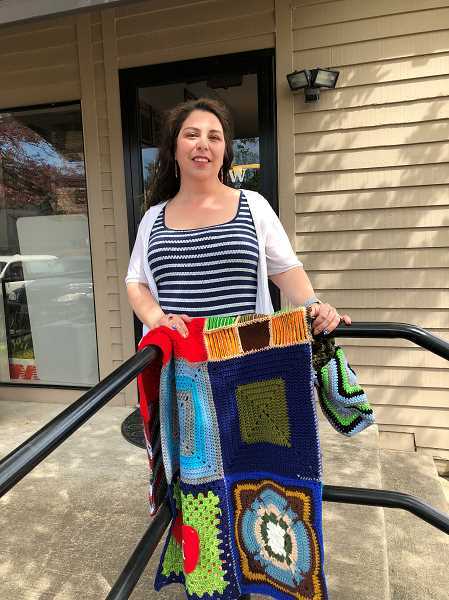 She reached out to the Clackamas County employees who crotched or knitted for help. "I'll be honest I thought that maybe I would get 10 people to volunteer, that would be including myself and a friend," she said. "By the time the blankets were completed I had 97 volunteers. And to make it even more exciting, I've been contacted by several community members and organizations. On Feb. 22, 2018 we delivered 30 blankets to the board of commissioners of Clackamas County. It was an amazing moment. But what made our hearts swell was the outpouring of love for all our vets from all of our community." Breuer had many requests to keep the project going, so "now we make blankets, scarves, hats and pet blankets for any vet that needs them." What began as a one-time project has morphed into Yarnivores4Vets, an organization which will soon have nonprofit status. Breuer says they are still working on blankets to supply the veterans at Veterans Village, and need help to do so. Breuer invites all those who knit or crochet to join the effort. To make the projects manageable, Breuer says blankets are made of eight-inch squares, with several people working on each blanket. "Ever heard of spreading the love?" Breuer said. "That's exactly what we're doing here." Once a blanket is completed a thank you note is written to the veteran recipient, signed with the names of every person who work on that particular item. "We want each veteran to know and see just how many people care for them and are thankful for their sacrifice," Breuer said. Breuer says the organization needs volunteers to help with knitting and crocheting and to donate yarn and cash for materials. "It's fun and easy work to do on your lunch hour or on vacation," she says. "And the small-sized squares make them easy to complete." Breuer says the project is helping keep the arts of knitting and crocheting alive as well. "Crocheting is kind of the black sheep of the fiber world," she said. "Most people are knitters, but this is a way to share this art along with love and laughter. It's the lighter side of supporting our vets." Yarnivores4Vets also makes scarves, hats and pet blankets. To learn more about the project visit yarnivores4vets.com or call Breuer at 503-912-4477.